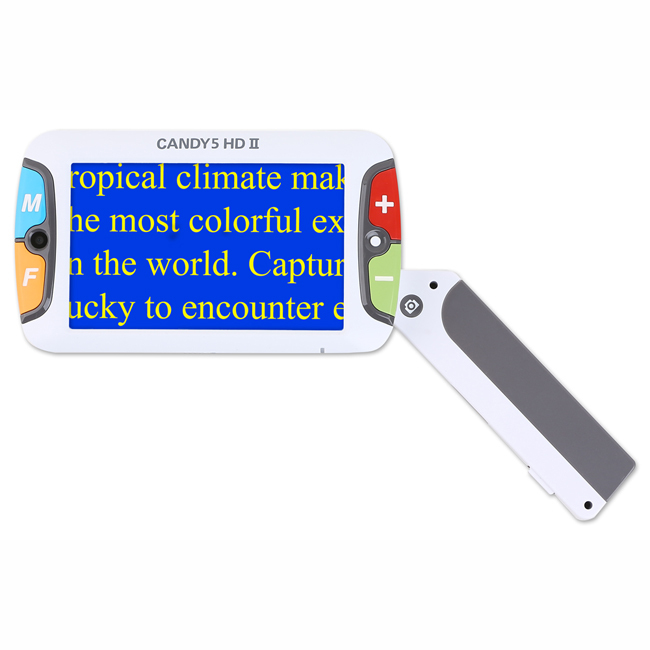 Candy 5 HD II - 5 Inch Color Portable Video Magnifier - 4.5 Hrs. of Battery Use! The new CANDY 5 HD II features a 5” high-definition wide-screen LCD and continuous zoom magnification from 2.5x – 22x. This versatile video magnifier has an intuitive center-position HD auto focus camera and can be used as either a “handheld” or “stand” magnifier. Use CANDY 5 HD II at home or take it with you to school, work, restaurant, pharmacy, bank, library, grocery or department store or on vacation.